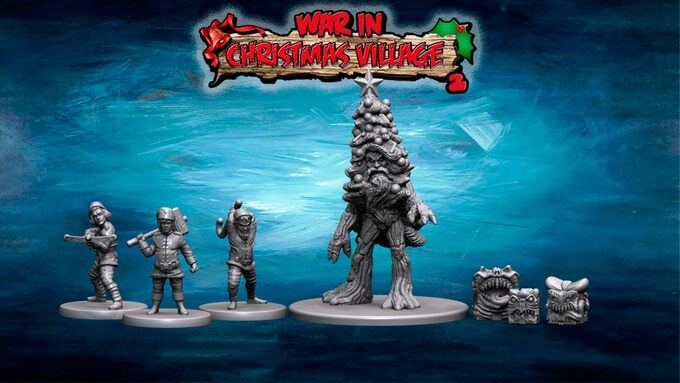 Today’s Starter, War in Christmas Village, tabletop miniatures! It’s that time of year again when the scent of fresh pine fills your home, carols float gingerly (see what I did there? ), carried by the cool winds of winter and the first few snowflakes fall silently to the ground, where ho-ho-holy crap is that a live snowman wielding a battleaxe?! The original range, funded in February of 2017, produced, and ready to make its way to backers, is now expanded upon with some beautiful new minis the likes of which your tabletop has been sorely lacking! Two boxes whose contents range in size from mimic-style presents to a full-blown Christmas Treeman (and with an arbalest-laden Mrs. Claus spliced in for good measure) are here for the taking and fall into what we feel are fairly decent pledge ranges for something this unique.